Tap Tuesday’s | Fit Family Robinson | The world is your gym. “Tap Tuesday” happened this week with my Mom…Grandma Kathy. 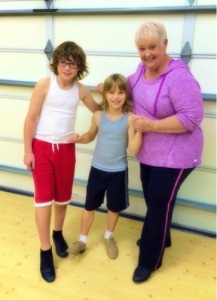 Weekly tap lessons are in the mix…and the boys are so happy. They are practicing their tap steps any time their feet hit a wood floor. My Mom started her own studio as a teenager in Ogden, UT. She did it on her own and had to ride the bus to her downtown location. She carried her record player with the speaker included (remember those? lol) and would teach all day on Saturday’s. She had a tap, jazz, ballet dance studio and professional performing groups for 30 years for ages 2 to adult. Teaching me and many others the love of dance. So many memories!! Now she is working with my kiddos and her teaching legacy continues. We are looking forward to TAP TUESDAYS!